Can Decentralization and Governance Co-exist on the Blockchain? 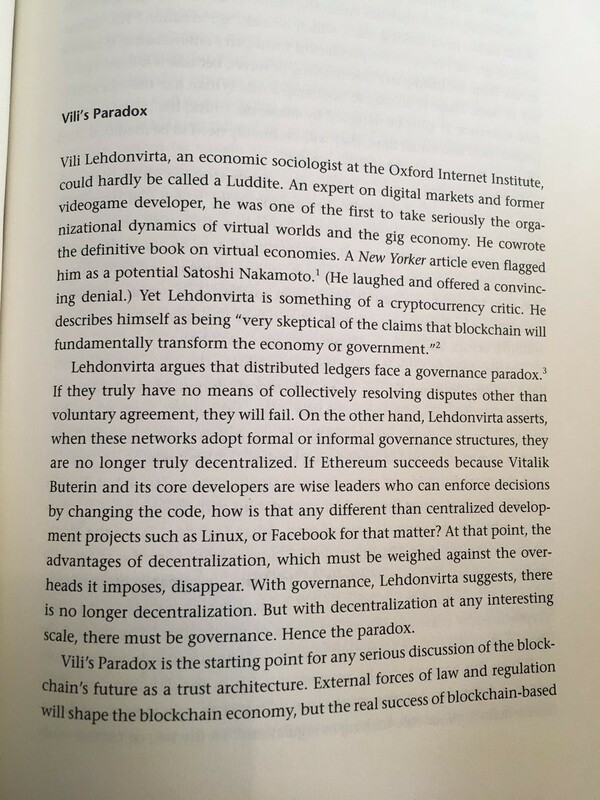 The reference to Kevin Werbach’s book, “Blockchain and the New Architecture of Trust,” fueled a fierce, three-day Twitter debate on the complicated relationship between decentralization and governance, which Werbach calls Vili’s Paradox. It’s named for the economic sociologist Vili Lehdonvirta, who argues a distributed ledger needs both governance and decentralization, yet also argues that the two cancel each other out. Storecoin believes its decentralized governance of checks and balances — a rules engine and coordination mechanism for the zero-fee payments protocol — will encourage acceptance of a p2p payments network by the various parties particpating in the global marketplace. That’s a hard sell for Bitcoin maximalists like Murad Mahmudov, who sees words like “rules,” “regulation,” and “verification” the very antithesis of what crypto is all about. Deeply committed to Satoshi’s vision of a decentralized digital currency, Murad is one of the world’s strongest Bitcoin supporters. He’s also one of the world’s biggest skeptics of governance systems that open crypto projects to the possibility of centralization. We may not agree with his analysis of Storecoin’s governance , but we appreciate when the Murads of the world scrutinize our research, engage us in conversation, and force us to validate our conclusions. This dialogue helps us all to grow. If, as we believe, the main purpose of governance (other than security from attack) is censorship resistance, then the design of that governance has to protect against the tyranny of any one group of stakeholders within a blockchain ecosystem over the others. That is why Storecoin’s governance is based on one entity/one vote, rather than a decision-making system that bestows voting power based on how many coins someone holds or stakes. We call it a p2p republic. Noah Pierau, a blockchain consultant with a special interest in decentralized governance, obviously isn’t sold on entity-based voting. Like Murad, he is skeptical of KYC. But he breaks with the Bitcoin-or-bust crowd on full support of stake-based voting due to the risk of a single entity amassing a majority of tokens. At least we agree on that point. We just don’t agree on what to call it. Storecoin’s governance design is multi-cameral. Four branches provide checks and balances that resist censorship, collusion, and centralized power. We are developing a protocol designed to achieve the best and fullest use of STORE as both a store of value and medium of exchange in the real world. Money has value because people can use it to buy and sell, as well as invest and hold. Currently, Bitcoin has achieved the first benchmark for real money: store of value. For wider adoption and pragmatic use, however, a truly successful cryptocurrency has to meet the second benchmark and operate as a medium of exchange. Investors like Bitcoin because they can afford to buy it and squirrel it away with the hope that its value will increase. But for everyone else, cryptocurrencies will only become valuable when they can be exchanged for goods and services. We see Storecoin as a viable answer to this need, not only because our decentralized governance model protects value, but because it creates a route for consumers, merchants and developers to use the network with zero fees.